For four decades, the nuclear nonproliferation regime has been rooted in the Nuclear Nonproliferation Treaty (NPT). The treaty has proven to be a success in keeping a large number of countries outside the nuclear club. Yet its effectiveness and relevance in the recent history of the second nuclear age has been put to test through three different cases— Iran’s pursuit of nuclear capability; North Korea’s exit from the treaty; and the unprecedented concessions and international civil nuclear cooperation extended to India—a non-NPT signatory state which has no obligations as a signatory state while enjoying de-facto recognition of its nuclear weapons program under the Indo-US nuclear deal. Yet the most profound challenge to the very essence of the NPT has originated from Iran and its controversial nuclear program, which was rejuvenated following the post-Shah interregnum. The Islamic revolutionary regime of Iran was motivated to seek nuclear technology as a hedging capability against external threats especially in the wake of chemical weapon attacks during the Iran-Iraq war. Domestic politics and the desire to secure prestige and influence as the leader of the Shia Muslims around the world may well have been additional drivers for the Iranian leadership’s proliferation decision in the late 1980s. Since then, Iran has aimed at harnessing the full potential of the peaceful uses of atomic energy and seeks to master the complete nuclear fuel cycle—ostensibly designed to meet the needs of an ambitious nuclear energy program. However, Possible Military Dimensions (PMDs), verification, and transparency discrepancies with respect to Iran’s NPT safeguards obligations remain contentious issues between the IAEA, the United States, Russia, France, Great Britain, China, and Germany (that form the P5+1 countries) and Iran. These countries are striving to reach a nuclear deal with Iran under the framework of a Joint Plan of Action (JPOA) that aims at reaching the most acceptable compromise for all stakeholders. While Iran has settled past controversies centered on undeclared uranium enrichment activities, it continues to develop the technology, expertise, and infrastructure for a self-sustaining nuclear energy program and all stages of the fuel cycle allowed under the NPT. Herein lies the paradox inherent in the nature of nuclear technology, i.e. its dual use potential. Iran has built several nuclear fuel cycle facilities, including a uranium processing and yellowcake center at Ardakan and Bandar-Abbas; a uranium conversion complex at Isfahan that produces natural uranium oxide, metal and uranium hexafluoride gas or UF6—the feed material for centrifuge enrichment; centrifuge enrichment plants at Natanz and Fordow; a nuclear fuel fabrication facility at Isfahan; a 40 MWt heavy water research reactor and heavy water production plant at Arak; and pilot-scale reprocessing facilities and the Tehran Research Reactor—the declared consumer for Iran’s uranium enrichment program— at the Tehran Nuclear Research Center. Each one of Iran’s fuel cycle facilities are under safeguards, yet the 40 MWt heavy water research reactor is geared toward producing medical isotopes is an ideal facility for the production of weapon-grade plutonium. 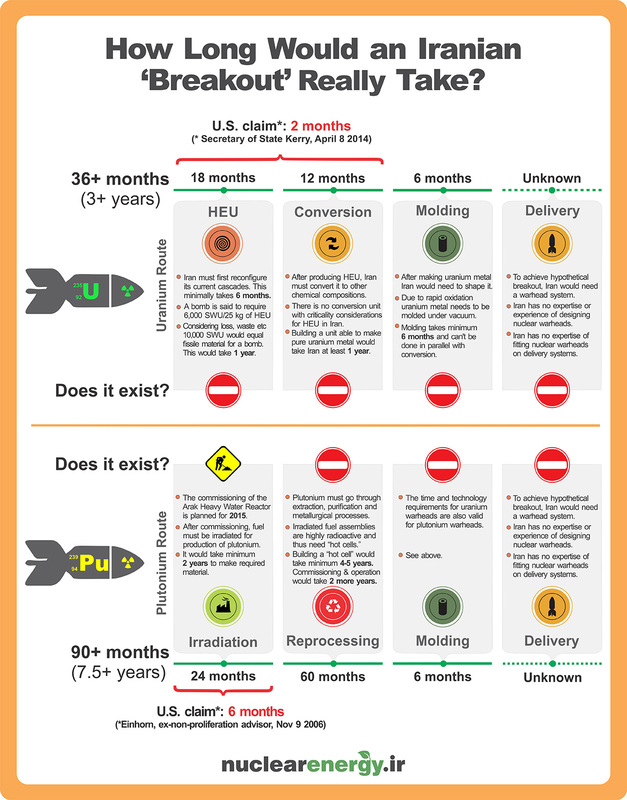 Converting Arak’s reactor design—which remains a contentious stumbling block in ongoing negotiations between the P5+1 countries and Iran—could render it unsuitable for weapon-grade plutonium production, and using power reactors such as the Bushehr LWR would be impossible under IAEA safeguards. Employing a power reactor to weapon-grade plutonium production would also be practically impossible as it would have to be run on low burn-up. This would be hugely expensive in terms of very high fuel consumption, which Iran cannot produce indigenously at present. Alternatively, Iran would secretly attempt to build a heavy water research/production reactor—which is also highly unlikely and almost impossible to conceal for long. Therefore, it would not be able to produce any significant quantities of plutonium suitable for weapon purposes and even hidden or concealed production reactors or reprocessing activities would eventually be detected before such a facility is able to irradiate sufficient fuel to produce any weapon-usable quantities of plutonium. However, Iran could set up a clandestine centrifuge enrichment facility deep underground that houses only a small proportion of its centrifuge inventory. Similarly, a small lab or pilot-scale reprocessing plant can theoretically reprocess/separate weapon-grade plutonium for several weapons before being detected. Significantly enough, a covert centrifuge enrichment facility would require feedstock, either as natural UF6 or Low Enriched Uranium. Diverting UF6 from Isfahan or LEU any of its declared centrifuge facilities would again be very difficult to hide from the IAEA. To produce 1 Significant Quantity of U-235, Iran would need at least 4500 SWU centrifuge capacity that would require 20 tons of natural UF6 as feed material which is not invulnerable to detection; whereas diversion of any amount of LEU from a safeguarded facility—while quite tempting in a breakout scenario due to the very short timeline needed for enrichment to weapon-grade—remains only a theoretical/hypothetical proposition under the NPT. Similarly, production of weapon-grade HEU in an undeclared centrifuge enrichment plant is also potentially detectable. Clandestine production of feedstock in the form of reactor fuel or UF6 for an arsenal of nuclear weapons would again prove to be extremely costly and challenging for Iran or any other country that wishes to violate safeguards. The effective implementation of the Additional Protocol and a nuclear deal with the P5+1 would make such a scheme a practical impossibility unless Iran decided to break safeguards and quit the NPT altogether. Iran has declared the need for a commercial-scale uranium enrichment program, designed to service the fuel requirements of the 1000 MWe Bushehr Light Water Reactor. This justification has been employed for expanding the existing inventory of over 9000 operating centrifuges having a 8,500 SWU/year capacity to at least operating 243000 IR-1 centrifuges equivalent to 190000 SWU/year. The reasoning for such an exponential increase in projected and planned LEU production capacity is the fear of dependence on and possible cut-off of foreign nuclear fuel supplies for Iran’s growing nuclear energy program. Interestingly, a commercial uranium enrichment program would need precisely such large numbers of centrifuges as it takes about 100000 SWU/year to produce 3-5 % LEU fuel for a 1000 MWe LWR such as Bushehr for which Russia has promised to fulfill fuel supplies. The same enrichment capacity can alternately produce weapon-grade HEU for more than 20 nuclear weapons. Under the JPOA, the western powers are attempting to limit Iran’s installed centrifuge inventory to about 5000 IR-1 (first-generation) machines and put a cap on the qualitative improvement in newer and much more efficient centrifuge designs such as IR-5, IR-6 and IR-8. However, if Iran is determined to run a parallel, clandestine weapon-oriented program, it might opt to develop a clandestine fuel cycle on pilot scale—specifically designed to produce fissile material for nuclear weapons. To run such a clandestine program, Iran could also skip the installation of feedstock production facilities and instead choose to develop selected end-product facilities such as centrifuge enrichment and reprocessing facilities. Their feed material—especially UF6 in the case of centrifuges and spent reactor fuel in the case of reprocessing—can theoretically be diverted at a scale small enough, yet sufficient for a few weapons-worth of nuclear material, but only in the case of ineffective, obstructed, or weak safeguards. In order to preclude the possibility of a potential breakout, Iran has presently been mandated by under the JPOA to convert all of its LEU enriched to near 20% for the Tehran Research Reactor into oxide powder for further fabrication into reactor fuel assemblies. Doing so would make it more difficult for Iran to achieve a potential breakout through its centrifuge program—quickly enriching the LEU to weapon-grade levels of 90% or more is an unlikely but not an impossible scenario. Nonetheless, enriching UF6 up to 3-5 % takes more than two-thirds of the effort that goes into making weapon-grade HEU. That makes even LEU of any concentration proliferation sensitive. But according to this analysis, fabrication of fuel from the LEU oxide would leave about 125 kg of LEU enriched up to near 20% as scrap, in-process material and waste—a large proportion of which is potentially recoverable or can be used in a breakout towards producing weapon-grade HEU. Notwithstanding these critical assessments, the IAEA has not been able to detect or report any diversions of nuclear material from Iran’s declared and safeguarded facilities. Almost all technical and legal analyses based on think-tank and IAEA reports regarding the safeguards implementation by Iran tend to equate the existence of a potential breakout capacity with almost automatic acquisition of nuclear weapons capability. If Iran were to pursue the objective of a weapon capability, it would need to do several things in parallel with the production of fissile material to prepare for eventual weaponization. Such a route would require Iran to either indigenously develop or acquire a theoretical bomb design; produce high explosive lenses; develop neutron sources and uranium/beryllium neutron reflectors; manufacture high-speed electronics; produce U-235 or Pu-239 metal in machined form; acquire a precision engineering infrastructure to fabricate the weapon’s nuclear and non-nuclear components into an integrated system; and install diagnostics and testing apparatus to validate the weapon’s theoretical design parameters during tests. The triggering mechanism and the explosive lenses will also have to be tested several times for reliability and performance through hydrodynamic and/or hydro-nuclear tests before a deliverable device is ready—although a gun-type device based on HEU does not need testing but would be virtually undeliverable and so militarily of little or no value. Therefore the Possible Military Dimensions of Iran’s on-going nuclear program relate to suspected high explosive testing at Parchin (also see: Pollack and Lewis) and Marivan. Such allegations are largely based on third-party information. Some activities related to these aspects of Iran’s suspected military nuclear program was mentioned in the November 2011 IAEA NPT Safeguards Implementation Report which were strongly contested by Iran. The JPOA itself has mainly focused on ensuring compliance of Iran’s NPT obligations with respect to nuclear fuel cycle activities centered on 15 declared facilities and nine other associated locations. But in the absence of conclusive evidence duly endorsed by the IAEA, allegations pertaining to the PMDs of Iran’s nuclear program are speculative at best, yet alarming to advocates of breakout scenarios —varying from a few months to a few years—in the international non-proliferation community. Nonetheless, whether or not Iran and the P5 +1 are able to conclude a deal by the summer of 2015, Iran has succeeded in having its rights accepted by the international community that it is entitled to under the NPT—complete mastery over the nuclear fuel cycle including indigenous R&D in heavy water and research reactors, fabrication of nuclear fuel, uranium processing and conversion, centrifuge enrichment and reprocessing—all of which can cumulatively allow Iran to produce fissile materials if it opts to break safeguards and leave the NPT like North Korea. Such a scenario is highly unlikely since Iran appears to be aiming at offsetting the adverse impact of years of sanctions rather than violate or abrogate safeguards. The IAEA has stated that Iran is fulfilling its commitments under the interim nuclear agreement under the JPOA with the six world powers. The successful conclusion of a comprehensive nuclear agreement with the United States, Russia, China, France, Great Britain, and Germany would lead to a massive influx of foreign investment and help improve Iran’s economy and ameliorate the impact of long-standing sanctions. Iran has already achieved the objective of acquiring latent nuclear capability right under the nose of the NPT. This, coupled with Iran’s oil and gas wealth, has accorded Iran with the nuclear option that will enhance its leverage, influence, and bargaining position in the region. Depending on whether one sees the glass as half-full or half-empty, the NPT has been a success and a failure at the same time. For proliferation alarmists and lobbies hostile to an exclusively peaceful Iranian nuclear program, nothing short of removal of all proliferation sensitive nuclear material from Iranian soil would be acceptable. For others, integrating Iran in the international system with full compliance of NPT obligations through a completely transparent and verifiable implementation of the Additional Protocol or a Iran-specific Additional Protocol Plus might be a way to allow Iran with a full fuel cycle and lifting of sanctions. In this context, the challenge to reconcile perceived security threats, proliferation concerns, and possible responses of Iran’s Arab neighbors that are signatories of the NPT (with Iran’s quest of nuclear technology while remaining within the NPT) is a complex and daunting task for the nuclear nonproliferation regime and the West. But how can one NPT-signatory state (Iran) be expected to accept a full Additional Protocol, let alone an AP-Plus arrangement when another non-NPT signatory state (India) has been rewarded with all the benefits of a signatory state (espoused under Article IV of the NPT) without ever demanding any additional or specific obligations or even an Additional Protocol outside its peaceful program? Dr. Mansoor Ahmed is a Lecturer in the Department of Defense and Strategic Studies (DSS), Quaid-i-Azam University (QAU), Islamabad. He holds a Ph.D in International Relations from QAU. He has also served as visiting faculty in the Department of Strategic and Nuclear Studies, National Defense University, Islamabad, from 2009-2010. He was a Visiting Research Scholar, Cooperative Monitoring Center, Sandia National Laboratories (August-December, 2013). His research interests include various aspects of Pakistan's nuclear program, primarily its evolution and technical development through several decades, and nuclear non-proliferation and arms control issues with special reference to South Asia. In the past two years, he has been engaged in different Track-II dialogues and initiatives related to arms control and nuclear issues in South Asia and has national and international publications to his credit. What Message Does the Latest India-Pakistan Crisis Send to Militants in Kashmir? Mansoor – very interesting analysis, particularly of the technical aspects of the JPOA and how they address, or might not address, proliferation concerns (if enrichment to 20% takes 2/3 of the effort, for example). Are you optimistic there will be a deal in the near future? Julia, the chances for concluding a comprehensive deal for both sides essentially depends on addressing the enormous trust deficit that has principally caused the long-standing impasse. One desirable outcome for Iran has been the removal of sanctions and for the West is ensuring that Iran is not able to divert its existing capabilities under safeguards for building a weapons program. The JPOA is essentially a political arrangement and eventually it will have to be a compromise political solution that is only possible if Iran’s right to R&D and qualitative enhancement of its program for peaceful purposes allowed under the NPT is not denied while ensuring that Iran ensures a transparent and complete implementation of its safeguards obligations in respect of declared and any undeclared activities/facilities. The solution lies in reconciling the basic interests of all parties within the framework of the NPT. Iran has already achieved a basic level of latent capability for the nuclear option without leaving the NPT (which it is unlikely to barter away) but that is not necessarily equivalent to a having acquired a weapons option at present (depending on how one interprets the known information on Iran’s existing potential).